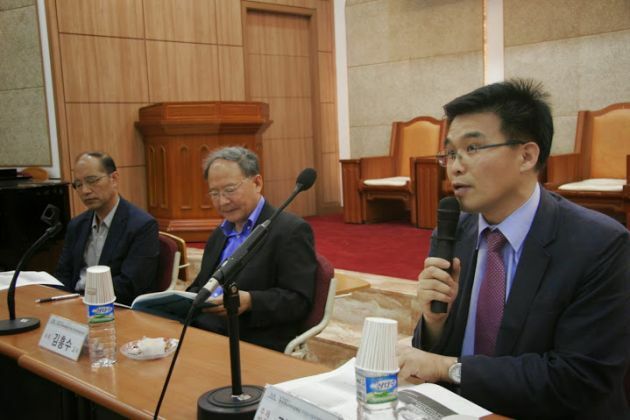 (Credit: National Council of Churches in Korea (NCCK))Museum curator Dr. Kwon-jeong Kim, right, highlights important questions for the establishment of a Korean Christian Museum. To his left sits Dr. Heung-Soo Kim and on his far left Dr. Hee-kuk Lim in this photo taken at the first open seminar discussing the museum on May 30, 2014. Two committees, consisting of well-known scholars and church leaders in South Korea, recently convened to discuss steadily progressing plans for a joint Korean Christian Museum in the nation's sprawling capital, Seoul. On May 30, the "Korean Christian Museum Establishment Committee" chaired by Rev. Dr. Young-Hoon Lee, and the "Historical Materials Committee" chaired by Dr. Heung-Soo Kim, Professor of Church History, convened in Zoe Hall at the Christian Center in Yeonji, Seoul, to hold an open seminar regarding the establishment of the museum. The open seminar was entitled: "The Korean Christian Museum: What should it contain, and how?" and was held in cooperation with the National Council of Churches in Korea (NCCK), according to reports by Veritas (Korean). During the seminar, Dr. Kwon-jeong Kim, Curator at the National Museum of Korean Contemporary History, highlighted important questions such as how the museum can reveal the identity of Korean Christianity, how to balance universality and specificity in exhibitions, and how to deepen and strengthen understanding of the history of Christianity in Korea. The seminar also brought up museum marketing aspects, such as how it could attract attention inside and outside of churches, and how to create a vivid place for children and teens to experience history. In a presentation called, "Preserving history is preparation for the future," Dr. Hee-kuk Lim, Professor at Jangshin University, introduced as an example the "Presbyterian Historical Society" in Philadelphia, U.S.A. The Presbyterian Historical Society, the national archive of the Presbyterian Church (U.S.A.), boasts more than 250,000 titles and 250 paintings, spanning more than 500 years of Presbyterian history, and Dr. Lim suggested that similar methods and procedures could be implemented in a museum exhibiting Korean Christian history. The NCCK General Secretary, Young-Joo Kim commented on the meeting that, "We [have] become keenly aware how important [it is] to live knowing the history," and, "if we put this on the backburner, our existence will be forgotten by itself, and I pray and hope that this first start today may be an opportunity to enrich the establishment of the Korean Christian Museum." In a committee meeting a week earlier, the location of the museum was decided as the Gangnam district in downtown Seoul. The Korean Christian Museum will be developed as a joint project between several Korean churches and denominations. The chairman of the Establishment Committee, Rev. Lee, 59, is better known as the pastor of the 830,000-member Yoido Full Gospel Church in Seoul, widely regarded as the largest church in the world. He took over as the Pentecostal church's lead pastor following the retirement of founder Rev. Dr. David Yonggi Cho, 78. South Korea is one of the most Christian countries in Asia, with Protestants making up approximately 18.3 percent of the population, and Catholics another 10.9 percent bringing the total Christian population to 29.2 percent, according to 2007 numbers. Christians have had a notable influence on South Korean society, and education in particular, having started 293 schools and 40 universities, including three of the country's top five universities. Sitting President Park Geun-Hye, who became South Korea's first female president in 2013, is a practicing Catholic, just as 1998-2003 predecessor and Nobel Peace Prize winner Kim Dae-jung, who died of natural causes in 2009. (Credit: Korean Christian Museum)The Korean Christian Museum logo, symbolizing the history and inheritance of the Korean church through the concept of "Connection and Weaving." The shape is based on the cross, connecting and weaving the history and faith of Korean churches. The logo also expresses Jesus Christ as Lord of all history, with the image of Jesus stretching his arms out.